DPSD is the abbreviation of Direction de la Protection et de la Sécurité de la Défense, a French security agency which is part of the Ministry of Defence. DPSD succeeded the former military security agency in 1981. Its roles are: counter-intelligence, general intelligence, counter-terrorism, and counter-subversion concerning national defense. The military, national defense institution, and defence industry are within its area of responsibility. It is also responsible for ensuring the security of personnel, information, materiel and sensitive facilities within national defense. It works in conjunction with the Central Directorate of Interior Intelligence, the sub-terrorism Directorate, the Directorate General of External Security and the Directorate of Military Intelligence. 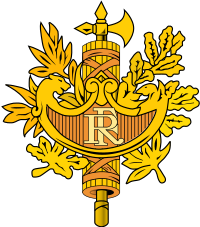 DPSD is a member of the French Community of intelligence. It is governed by Articles D.3126-5 D.3126-9 of Defense Code. The management of protection and security of defense is the intelligence available to the Defense Minister to carry out its responsibilities for security of personnel, information, materials and sensitive facilities. Its remit includes the prevention and detection of violations of national defense security. Like the Directorate General for External Security (DGSE), the DPSD is one of the "intelligence" agencies reporting directly to the Minister of Defense. The Commission includes a command destined for clearances at different classification levels of information be provided ( "Confidential Defense," "Secret Defense", or "Top Secret Defense"), and monitoring of personnel (military land forces, air, marine, police, defense, health, species and official or civil). The DPSD is present in all the theaters of operations abroad where French forces are engaged. The DPSD also has responsible for industrial security, in relation to the high technical value defence industry companies. The strength of the DPSD, slightly decreasing from year to year, numbered 1,279 people in 2009. In 2004, funds vested in the DPSD (excluding salaries and benefits) amounted to 11.4 million euros, a decrease of 0.6% over 2003. The operating budget in 2004 was 7.7 million euros. Equipment financing (manufacturing and infrastructure) amounted to 3.7 million euros, or 1.7% less than in 2003. In 2004, there were 1,475 people, including 1,097 military and 378 civilians. In 2003, there was a significant shortfall in personnel within the DPSD, with staff levels about 12% below the budgetted allowance. The 2006 appropriations for DPSD totaled 89.9 million euros, representing 1% more compared to 89 million euros in 2005. Staff costs amounted to 78 million euros, operating expenses at 7.7 million euros and capital spending to 4.2 million euros. The authorised Personnel establishment for 2006 was 1,459. In 2006, there were 1,459 people, including 1,090 military and 369 civilians. The DPSD contains a high proportion of non-commissioned officers, who represent two-thirds of military personnel. They are mostly defense security inspectors and shipbuilding security inspectors. Civilian personnel, for their part, constituted 85% of Category C officials and staff workers. This page was last edited on 28 May 2017, at 22:12 (UTC).